Second only to the Blue Whale in size, the Bowhead Whale is one of the longest living mammals in the world! They are uniquely adapted to living all year round in the cold, harsh Arctic seas. Bowhead Whales are famous for their complex and beautiful songs, which they use to communicate with each other. The Bowhead Whale can grow up to 60ft (18m) in length and weighs up to 100 tonnes, making it the second largest mammal on earth after the blue whale. Bowheads are one of the longest living mammals on the planet. One individual caught of the coast of Alaska in 2007 was found to have a harpoon point embedded in it that dated back to 1880, suggesting that it was at least 130 years old. Experts believe the oldest Bowhead could be as old as 200! The Bowhead Whale is named after it’s huge bow-shaped mouth that also makes it look like it’s smiling! It’s mouth contains a 3-metre long baleen that is made up of 300 plates. This is used to filter plankton and tiny crustaceans like krill. Despite their vast size they are still able to leap entirely out of the water. 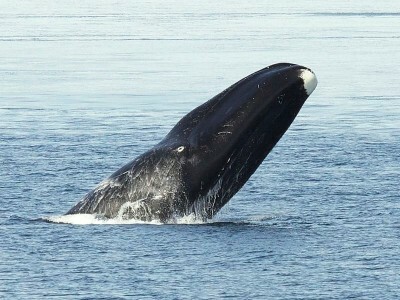 Bowhead Whales are uniquely adapted to living all year round in the Arcitc seas, spending much of their time under the sea ice. They are well adapted to this hostile environment. They have thick blubber for insulation that can be up to 29 inches (70cm) thick and can crack ice up to 7 inches (18cm) thick with their powerful skulls and bodies in order to create breathing holes. Their movements and migratory patterns are influenced by the melting and freezing of ice. Bowheads communicate under the water through vocalisations. They have an extensive repetoire of calls and even complex songs. One study identified 60 unique songs at a wintering ground. They found that the Whales were at their noisiest when the water was at is coldest and the ice was thickest, leaving them in almost total darkness. Bowhead Whales were heavily hunted from the 1500s until the end of commercial whaling in the early 20th Century. This led to a major reduction in the population, but numbers are now recovering. Current threats include oil and gas development in the Arctic and climate change. The Arctic is warming more rapidly than anywhere else in the world, and this threatens to fundamentally change the Arctic environment.